In the summer of 2009 Madelaine will embark on a remarkable journey to the North Pole aboard the 50 Years of Victory, the world's newest, largest and most powerful icebreaker. Organized by Zegraham's and Quark Exhibitions, the voyage with visit Helsinki, Findland; Murmansk, Russia and the North Pole. 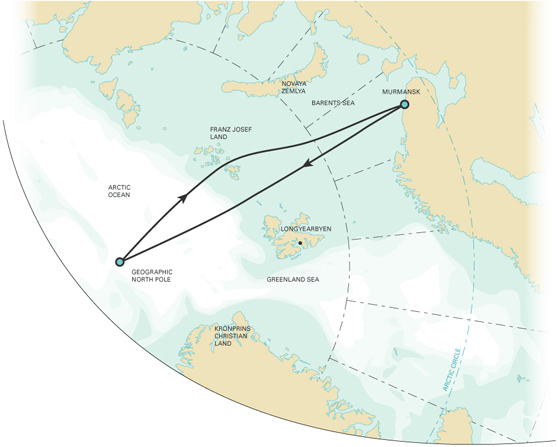 The purpose of the trip is to revisit the Arctic environment she originally traveled to in 2006 and extend her exploration further to the actual North Pole. These images and experiences will further contribute to Madelaine's series of artworks on her Global Warming exploratory theme. The itinerary which follows is Zegrahms' description of the itinerary of the trip. Fly to Helsinki, Finland with overnight stay. Transfer to 50 Years of Victory, the world's largest nuclear-powered icebreaker and set sail on the Arctic Ocean. Cruising the Arctic Ocean is a hard-to-schedule element of the voyage. Timing, landings and wildlife sightings are all subject to weather, sea ice conditions, and the natural cycles of wildlife. No two expeditions are alike, and Arctic Ocean conditions are completely unpredictable, making it possible for the journey to take as many as eight days. The destinations is the geographic North Pole, a mathematical point where the imaginary line of the Earth's axis of rotation passes through the Earth's surface. The Pole itself has no length, width, or breadth, and because the sea-ice at the pole is constantly moving, there can be no plaques or markers to indicate the spot. If conditions permit, the gangway will be lowered and it will be possible to descend on to the ice surface at the world's most northerly point. During the Southbound sailing, polar bear sightings are possible and there will be opportunities to watch magnificent animal and bird wildlife, or take photos or videos of the midnight sun. Franz Josef Land is an archipelago comprising of 191 massive flat-topped islands, often surrounded by fast ice. Situated only 560 miles from the North Pole, they are the most northerly islands in Eurasia. Arctic foxes patrol the landscape, steep cliffs are the habitat of thousands of nesting seabirds, and polar bears, whales and walrus inhabit the waters off the island. During time here, landings can be scheduled at any time of day to take advantage of the long hours of Arctic Circle daylight. Helicopter transfers will allow small groups to go ashore to hike pristine beaches and take in the scenery.